The Shot of the doctor running past the clock (talked about on the commentary). The Duck Pond that hasn't got any ducks. 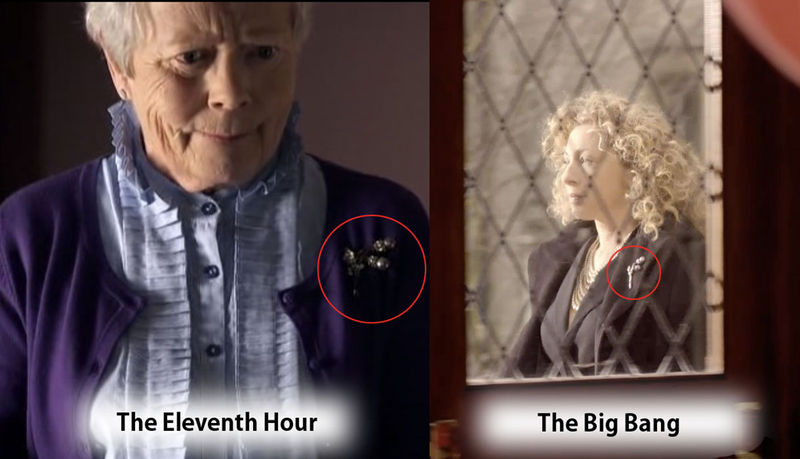 The re-use of Mrs Angelo's broach in The Eleventh Hour and The Big Bang. One of little Amy's artwork which clearly shows her house on fire. The Fact that Rory in the Hospital looks behind him, clearly sees something and gets interrupted and quickly forgets. ooohhh this sounds interesting! I have no doubt Moffat knows exactly what he is doing. I can't wait for the final episode of the Ponds. It will be so sad at the same time too though. "Why did you say six months? It's important! Why did you say six months??" THAT is a question that has also remained unanswered. Well, Mrs. Angelo's broach can easily be explained. Amy inherited it when Mrs. Angelo passed away and it ended up in River's possession sometime afterwards. I think that "Duck Pond without ducks" might be it. Don't remember anything in that episode to be more mysterious than that. Mrs Angelos broach probably is not important, it happened before to use the same gadget twice.And the Rory see something, looks behind him was discussed during "The Silence" and I don't think it was on purpose. Everybody to their dvds! We shall search EVERY FRAME until we find it!!!! Rory Double-take may be a Silence preview. at the duck pond part there is a statue in the background behind amy. just an idea. I always thought the "duckless duck pond" was a reference to Amy's ability to remember things that the crack in her wall had erased. The Doctor said it himself: "How do you know it's a duck pond if it's never had any ducks?" If you ask me, I think it's something that is small and doesn't seem to have any reason. Moffat likes to do things like that. I like the one with Amy's house on fire, but I think it is a little bigger, maybe the broach. I think she's Mrs. Angelo; it would make sense that she'd give a younger version of herself the brooch, and we know that River appears in the same episode where the Ponds depart—plus "I've seen you before," that's just heartbreaking. That is why it was there - it was a metaphor for remembering things even though the reason for the memory has gone. A little like the crack that was sucking things and people out of existence, yet leaving little things and memories from them lying around. in the eleventh hour, there's a scene that happens after the doctor enters his new tardis, it cut backs to Amy as a child still waiting, we hear the sound of the tardis engines and she looks up, and it cuts to her waking up as an adult and running out in her nightie just before they dissapear and reveal the wedding dress... anyone else know what im on about? What about how little Amy says how her mom would put faces in the apples for her. But her parents were taken by the crack and she isnt supposed to remember them, then how does she remember that? This kinda just hit me. This might be how long her and Rory might have been dating at that time. Maybe dating Rory had her grow up and weaken her believe in the Doctor. But that's just me. yes! that was one I thought of! There is also a Silent in the TARDIS. (No, not the holographic one.) Amy reacts to it twice during The Lodger episode, and quickly forgets. It isn't seen on screen though. Yes, but that was explained as a total goof on costuming, supposedly. I really honestly want to believe the theory that Jeff is the Doctor and River's son and Miss Angelo is Amy. That family tree would actually work since Miss Angelo is Jeff's gran. And maybe River gave the brooch to Amy. That would explain how she has it in the Eleventh Hour. I think it is at the end of the episode when little Amy is waiting for the Doctor and she hears the sound of the TARDIS and looks up and smiles. I never even thought that was a dream till I read online that, that was what people thought. I always figured it was him coming back for her but it just wasn't going to be shown or something. I doubt its the duck pond because Moffat already explained that he meant to show Ducks returning to the pond at the end of the Eleventh Hour but logistically the ended up not being able to. The broach seems to obscure to be it. Probably the costume team just recycling not expecting crazy fans like us to even notice. Same goes with the drawing of Amy's house burning. Just seems too obscure. I know Doctor Who is known for making throw away things important but never random small images in the background no one ever sees anyways. I will say I am intrigued by Rory being confused in the hospital. There is also that first shot where the Doctor is hanging from the Tardis and looks inside as if he sees someone. There are actually a few examples of similiar things happening throughout the series so I would be interested to see that be a thing. Same goes with the staircase. That was something I didn't even think about till I read it online. Perhaps it is like in the Lodger where it leads to a spaceship but I have a feeling Moffat is saving the makeshift Tardis and the silence for later on this season or maybe even next. No I am pretty convinced the scene Matt is refering to is of little Amy Pond being taken away by the Doctor in the end. Why? I guess we will just have to wait and see wont we! Holy crap... you guessed it exactly! Impressive.